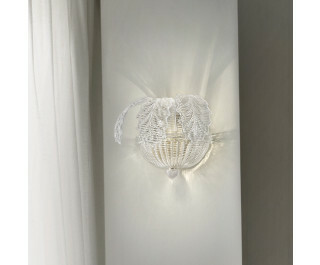 Cast glass lamp with grit characterized by crystal color and gold color frame. It is enriched by its refined blown glass in amber color with transparent rigadin effect and molten gold 24K. Giudecca is made up of leaves, which are separately produced and screwed to the central frame. Its stylish design and its impressive brightness are the ideal lighting solution designed to complement classical environments, such as bedroom, living room, drawing room, guests bedroom and studio.